Myth: Mini Holland road ‘closures’ means no one will be able to drive to my front door. Fact: Every road with a modal filter* has car access in and out, and motor vehicle access is maintained for every property in Waltham Forest, except for a few located in a single 50 metre block of Orford Road between the East Avenue and Eden Road junctions (and currently even this filter is only in force 10am – 10pm). Google Maps is updated constantly and shows all current modal filters shortly after installation, so taxis and delivery vans shouldn’t have a problem finding you. Its worth noting that over the last 2-3 decades when new housing developments are built, it’s standard practice to create cul-de-sacs in order to make the streets more pleasant, safer and to reduce car dominance. Myth: Those who are elderly or disabled and difficulty walking & cycling and will be badly hit by these changes? Fact: People who really need to drive will still be able to and with reduced traffic overall their journeys should be much improved. Many people with disabilities don’t have cars, and lots of them cycle. Cycling is actually an inclusive mode of transport that will often act as a mobility aid for people who find walking difficult, people who can’t walk far and even those who cannot walk at all. Myth: Mini-Holland is only going to benefit the 3% in Waltham Forest who currently cycle. Fact: Mini-Holland measures are focused on making walking more attractive, and on the high proportion of residents in the borough who say they would like to cycle, but don’t because the roads are too dangerous. In some parts of the borough as much as 7-8% of commuter journeys are by bike. Fact: 42% of Waltham Forest households have no access to a car yet suffer pollution at the hands of those who drive. In the newly filtered ‘villages’ the proportion with no car access is around 50%. If you can afford to run a car in London, you are part of a privileged minority. Myth: The Emergency Services have not been consulted about Mini Holland., and they have raised serious concerns about access to properties in Waltham Forest. Their response times may be adversely impacted by Mini Holland. Fact: All 3 emergency services (police, ambulance and fire brigade) have been engaged and consulted throughout the Mini Holland programme, and at no point have they raised any objections. 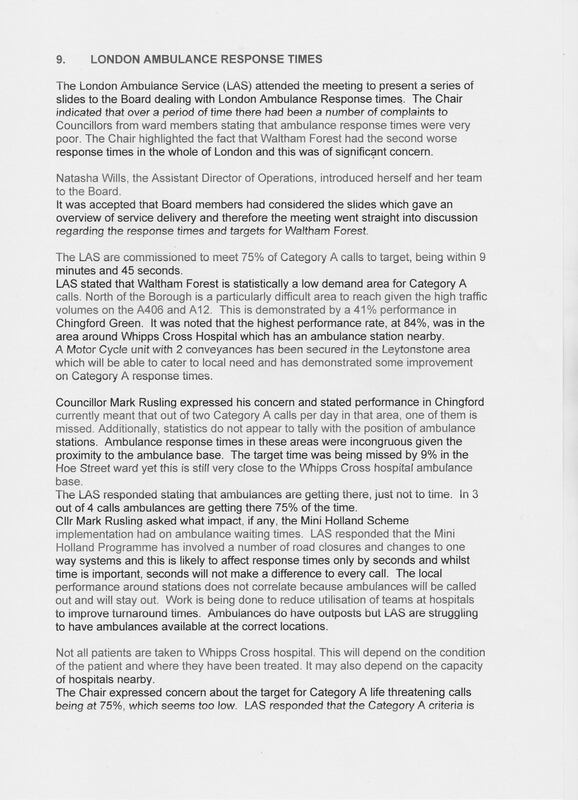 Where problems with ambulances locating properties have been reported, this has been down to London Ambulance Service using outdated satnavs. Furthermore following concerns raised by residents about part of the Hoe/Wood Villagisation area, the station manager of Walthamstow Fire Station on Forest Road asked his team to drive a vehicle to all the roads in the Poets Corner / Howard Rd area to check that roads will continue to be safe after the modal filters are installed. He has fed his comments directly to the Mini Holland officer team. An FOI request made to the London Fire Brigade about Waltham Forest has shown that the average response times of fire appliances has reduced recently. 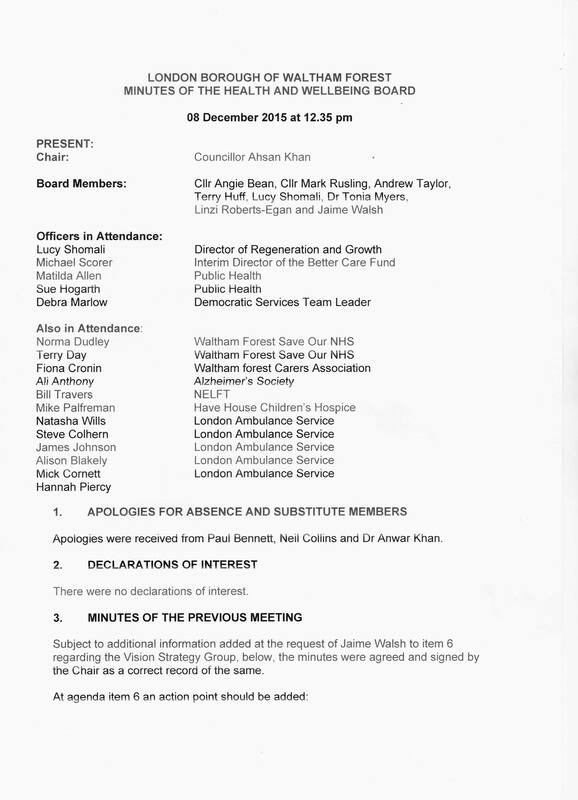 The Borough Commander states “It is my view that this data does not show a increase in response times and therefore that the road closures in Waltham Forest have not had a significant impact on our services”. Extracts from the response to the FOI request are below. Here’s a letter of support from Barts Health NHS Trust during the Mini Holland bid process. Myth: Waltham Forest is introducing 20mph zones across residential areas but the more we slow down traffic the more pollution we’ll have. Fact: A recent study by Imperial College found that diesel vehicles with engines of between 1.4 litres and 2.0 litres produce fewer harmful emissions at 20mph than at 30mph while smaller petrol and diesel engine vehicles both generate fewer particulates when driven at this lower speed. Download the report here. Myth: My customers/deliveries can’t get to me, so how will my business survive? Fact: Research shows retailers overestimate the importance of the car. Making public environments more attractive for pedestrians and cyclists can boost footfall and trading by up to 40%. People who get to the shops by cycling may spend less per visit than motorists, but they visit more often, and they will spend more money overall. Furthermore, pedestrianised areas still manage to maintain vibrant shops and businesses. Generally they are able to do so by coordinating delivery times, sharing delivery vehicles, making deliveries using smaller vehicles (or even cargo bikes) or making deliveries out of hours. Fact: The council has consulted widely using a range of media, and their engagement processes are now of a high standard and far superior to the vast majority of local authorities in the UK. 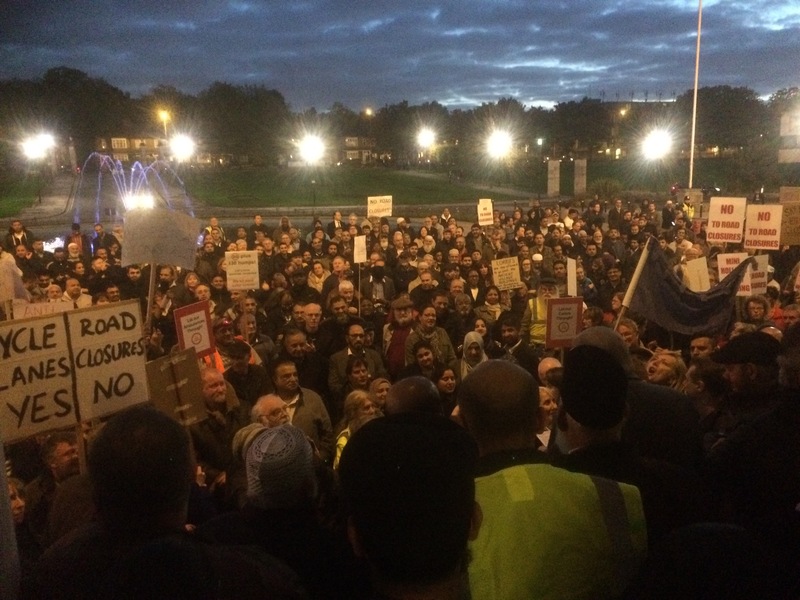 A judicial review in late 2015 found that the council had consulted properly. Myth: Its a stupid idea to try to make our streets safe enough for children to cycle. Fact: The school run accounts for at least one in every five cars on London’s roads, and is a major cause of congestion, pollution & frustration for road users. Fear of road traffic injury is the key reason people give for not cycling and that parents give for limiting their children’s independence. Many people say they drive their children to school because the roads are too unattractive and dangerous to walk or cycle. But in doing so they add to the problem. In Waltham Forest 14% of children age 11 are overweight and over 23% are obese or overweight. Every hour you spend in a car makes you 6 percent more likely to be obese. Every kilometer you walk (about 0.6 of a mile) reduces it by almost 5 percent. So making active travel safer and easier means better physical health for children. Myth: The council plans to remove the copse of mature trees that stand on the Whipps Cross Roundabout. Fact: The Whipps Cross Roundabout will be replaced by a T-junction, making it much safer and convenient, especially for people on foot, on cycling and bus users. It will result in the return of 1,850 square metres of land currently devoted to the road network back to Epping Forest. The council have committed to carrying out a tree survey and seeking specialist arboricultural advice about the relocation of healthy mature trees. More new trees will be added as well as other planting to make the area more attractive. Fact: Blended crossings, identified by special paving and road markings, are designed to slow down vehicles when entering or exiting side roads and encourage vehicles to give way to pedestrians crossing the road, reinforcing the rules of the Highway Code. As they are new to the borough and the UK, there will be a period of adjustment as people get used to the new layouts. However the design has been through an extensive evaluation process, including an independent road safety audit. The council continues to monitor them to identify potential safety issues. Myth: All we need is cycle lanes on main roads; road closures are unnecessary. Fact: Traffic speeds and volumes are currently too high in residential areas for most people to feel safe enough to cycle, or to let their children cycle. Drivers traveling through their own neighbourhood usually travel slower and are more careful than when cutting through other residential areas. We need to encourage people to consider alternative means of transport by making walking and cycling a quicker and more attractive option than jumping in the car. More than 40% of outer London car journeys are less than two kilometres and the school run accounts for at least one in five cars on London roads. On its own, improving cycle lanes is not enough to encourage the level of behaviour change we need to address congestion and dangerous levels of pollution. Myth: We can drop the road ‘closures’ from the Mini-Holland programme & still get all the other benefits. Fact: Modal filters were a fundamental part of the ‘Villagisation’ proposals in the original bid to Transport for London (TfL), and as we have now seen demonstrated in Walthamstow Village are key to delivering a better environment for those who walk and cycle. Crucially TfL have made it abundantly clear that they will withdraw funding if there is any attempt to ‘water down’ the proposals, as Kingston found when they tried to backtrack on an aspect of their bid. So should there be any successful campaign against the introduction of filters in an area, it will simply mean that area will get no money for any improvements whatsoever and will stay exactly the same (apart from probably attracting additional displaced rat running motor traffic). Fact: Depending on the layout of your street, they will either be able to unlock a bollard to exit, reverse down the street (as they already do in many borough streets), or drive forward as usual. Fact: the intention of the Mini-Holland programme is not to stop car journeys being made, but simply to make them a little less attractive, and to encourage more people to use ‘active’ modes of travel. Myth: Road closures will just push all the traffic onto the main roads, causing longer journeys, traffic jams and more pollution. Fact: The filtering of a road will result in the adjustment of motor vehicle traveler behaviour to compensate … some people will stop making particular trips, condense multiple trips into one, re-time their trips to a less congested time, or switch to public transport, walking or cycling. See what Wikipedia has to say about induced & reduced transport demand. Initial figures from the Walthamstow Village area show traffic levels on main roads have increased by between 3% and 11%, but the number of vehicles in filtered roads has decreased by 56%. This means that across the overall area, there are around 10,000 fewer vehicles every day, an overall reduction in traffic of 16%. Myth: Mini-Holland will cause more pollution. Fact: Pollution will drop dramatically in most roads in ‘villagisation’ areas due to a significant reduction in motor vehicle journeys due to a transfer to more benign modes. However, if there are roads which are maintained as through traffic rat runs, they may experience some increase in vehicle flows and hence pollution. Major roads alongside villagisation areas may see a short term increase in congestion & pollution immediately after filters are installed, but this is expected to return to previous levels as ‘traffic evaporation’ takes effect … they are already relatively congested at peak times and thus have little additional capacity for more motor vehicle journeys. Myth: Traffic evaporation is fallacy, and to reduce congestion we need more space for motor vehicles, not less. Fact: Though it can seem hard to believe, reducing road capacity does actually reduce traffic. A major study from 1998, which used 150 sources for evidence, found that roads that had their capacity reduced saw an average 41% reduction in traffic. Less than half of the displaced traffic found other routes, while 25% disappeared entirely. Source Wikipedia on “Disappearing Traffic”. Think about the removal of some road space for ‘Games Lanes’ during the Olympics, along with weeks of posters and information meant that London was prepared and, every day of the Games, over a third of people changed the way they traveled in painless and positive ways (Londonist 7 Aug 2015 “Taking Road Space Away From Cars Won’t Create Traffic Jams”). New York City started adding new protected bike lanes in 2007, and there was concern that taking street space away from cars would slow down traffic. A new report from the city after years of data collection has shown that for some streets redesigned with protected bike lanes, travel times are actually faster (“New York City’s Protected Bike Lanes Have Actually Sped Up Its Car Traffic”). Myth: Cycle routes can be diverted through residential streets and parks rather than taking up space on main roads. Fact: Cycle (and pedestrian) routes need to be as direct as possible because people are using their own energy to move. That’s why pedestrians cut across the grass in parks and ignore crossings when they’ve been badly situated (not on the “desire line”). Conserving energy is even more important on longer journeys, which is why linking up parks and indirect ‘quietway’ routes is a bad idea. The Netherlands makes their bike (and mobility scooter) lanes the most direct, and prioritises them ahead of motorised traffic. The UK often does the opposite, prioritising shorter distances for cars and making pedestrians and cyclists go the longer way round, often via footbridges and unpleasant underpasses. The unsurprising consequence of this is that people prefer to drive. Myth: The Leytonstone Town Centre proposals only have one modal filter proposed because Cllr. Clyde Loakes does not want upset residents in his ward. Fact: There are already a considerable number of long-standing filters that have kept residents’ roads free of through traffic (eg Church Lane, Barclay Road, Bushwood, Grove Road), so there are few residential streets left which would benefit from filtering. Myth: The council in league with mayor Boris Johnson is imposing controlled parking zones so they can get around planning laws. For example, if a CPZ is in force, they can claim land is a car free zone and build thousands of new homes. This is destroying our community, and therefore CPZs should be opposed. Fact: Waltham Forest’s population is projected to increase by more than 30% in the next 30 years*, requiring additional housing and resulting in a potentially significant rise in traffic levels. Rather than trying to circumvent planning laws, the car free planning policy is actually designed to mitigate the impact of new housing developments on the local area. It means people living in new developments within controlled parking zones are not allowed to apply for parking permits. Without this restriction, those people would buy cars and fill up local parking spaces, which we are sure some of the anti CPZ campaigners would not be happy about. The simple fact is, our streets cannot take any increase in cars, either parked or moving. * (Source: “Waltham Forest and its people” : http://www.walthamforest.gov.uk). Myth: Most cyclists ride on the pavement with no regard for pedestrians’ safety and peace of mind, so they don’t deserve public support or investment. Fact: Some cyclists ride on the pavement because they don’t feel safe on the road – this does not justify their behaviour, but if we build enough high quality protected infrastructure they really have no excuse. To put this in perspective, official figures from the DfT tell us that 2010 and 2014, three pedestrians were killed in an incident involving a cycle on a footway or verge in Great Britain between, whereas on average, 34 pedestrians each year were killed by vehicles on the footway/verge. Myth: Cyclists can ride on the pavement terrorising pedestrians with impunity as there is no enforcement. Fact: The Metropolitan Police issued 51 fixed penalty notices to people riding bikes on the pavement in Waltham Forest between April and December 2015. This is the second highest figure for London boroughs, beaten only by Southwark with 129 tickets. Fact: Electric cars are still not widely available. Also, they require electric power so still contribute indirectly to pollution levels. And they will not resolve the congestion issue. And here are many more common myths about cycling, and the truth: Cycling Fallacies.